OK, so my Photoshop skills are hideous, but the point is, what happened to Erasmus Bunny II? 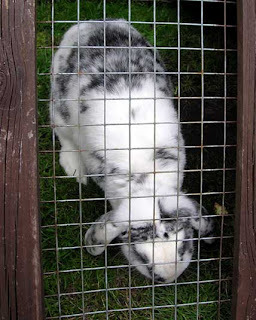 When we went past his hutch at the weekend, we saw a rabbit, but it didn’t look quite like the mascot of this very blog. It looked like a thinner and more lively version. Had they put Erasmus on a diet at last? An enquiry at the Darwin House drew a blank, but the staff in the Cathedral bookshop told us that Erasmus Bunny II died peacefully in his sleep about a month ago and his son, Erasmus Bunny III, has now taken over the role of official Lichfield Cathedral Rabbit. As Johnson said of Pope in his Lives of the Poets: “The death of great men is not always proportioned to the lustre of their lives.” I think we can say the same of this portly – sometimes grumpy – but very important rabbit. 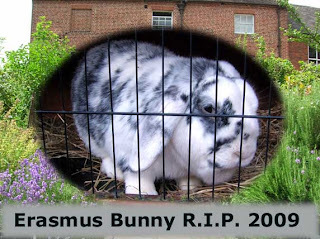 …Long Live Erasmus Bunny III. This is a tragic day. I'm reminded of the closing scenes of "Watership Down".